If you’re looking for an extravagant gift that fits all occasions from corporate events to birthday celebrations, this stunning tower of vibrant magenta Singapore orchids is your solution. 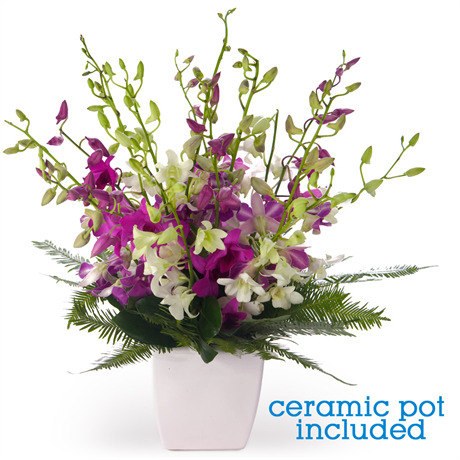 Also known as the Vanda orchid, these blooms are long lasting, impressive, and elegant. Creatively arranged amid a haze of complementary foliage, this gift is perfect for showing how much you care and shows your thought and effort. We recommend pairing this resplendent arrangement with a bottle of premium wine, or perhaps an offering of delicious chocolates. When you want to spoil the best, send the best.